One year after the end of the Great War W.H. Park and C.W. Ward founded their company with a clear determination to produce coachwork for motor cars. This marked a considerable difference to the established coachbuilders, who almost without exception were looking back to founding dates at times when the horse still reigned supreme and only coaches had been in demand. However criticism wasn't ill-based that antiquated techniques from that era still were transferred onto the production of motor car bodies. Automobiles were by far faster than a coach could be, very often cars were bigger too and the working conditions demanded the body should perfectly harmonise with the chassis. It was a gesture of confidence for the 1919 founded company of Park and Ward, when only one year later the first coachwork for a Rolls-Royce Silver Ghost was ordered from them. Quality alone however doesn't guarantee economic success. As soon as 1924 the partners had to face financial difficulties which only were solved by taking outside capital. The company changed its name to Park Ward & Co.
After one of his rare visits to the London sales bureau of Rolls-Royce the chief engineer Frederick Henry Royce by pure coincidence spotted a motor car with a Park Ward body parked by the side of the street. The perfect work and the well-designed details impressed him. Immediately after he had returned to his drawing office he ordered H.I.F. Evernden, a member from his staff, to go to Willesden without any delay and contact the coachbuilder Park Ward. This visit came at just about the right time, because Park Ward again was near the edge of bankruptcy. Rolls-Royce's appreciation led to a number of orders which helped Park Ward to bridge their difficult situation. In steady contact with F.H. Royce's construction bureaus in West Wittering and Le Canadel - since the pre-war time the chief engineer had not entered the factory at Derby with but one exception - new ideas were experimented with. Slim steel B-posts for example replaced the former wooden ones. This saved weight and gave better visibility. Going further step by step Park Ward developed a steel skeleton instead of wooden one and patented this in 1936. Thus a higher degree of stability was gained and the problem of vital parts made from wood being prone to rot was solved. The co-operation between the coachbuilder and the motor car manufacturer worked very well. Numerous bodies for prototypes, so-called experimental cars were made. In 1930 Rolls-Royce motor cars were counting for more than 90 % of Park Ward's production. Two years later a contract was signed, to build several bodies in series, as a sort of standard body, for Rolls-Royce. This enabled customers to take complete Rolls-Royce motor cars with coachwork by Park Ward directly from the showroom if they found design and interior to their liking. Consequently the production changed to go on on a bigger scale and at the best time the rate went up to eight bodies per week for Bentley alone. But co-operation had changed to complete dependence. 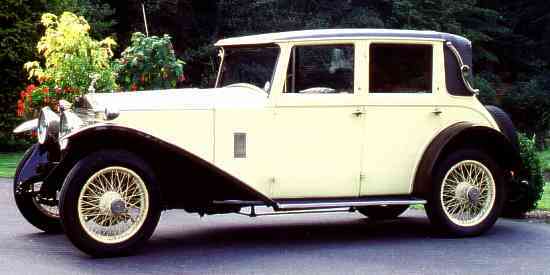 In 1939 Rolls-Royce took over Park Ward. After the interruption due to WWII production started anew. Although the status of separate identity had been kept, bodies were built for Rolls-Royce and Bentley only. considerable number of Rolls-Royce from the early post-war period exist, whose appearance must have been quite old-fashioned even then because Park Ward stuck for some time to pre-war design ideas. A radical orientation to present time demands came with the sportive styling for a few Bentley R Continental and the Bentley S Continental of the fifties. Two door cabriolets and coupés - although Rolls-Royce had chosen the term two door saloon - were created which were and still are much sought after by connoisseurs. With coachwork in the form of drophead and fixed head coupés for Alvis motor cars Park Ward tried to catch some additional business. Alvis had bought drawings and wooden body formers for a design by the Swiss coachbuilder Hermann Graber from Wichtrach near Berne. After Alvis' attempt of co-operation with Willowbrook quickly failed it was decided to order bodies made by Park Ward. For several years Rolls-Royce and Bentley and Alvis were clothed side by side at the Park Ward factory. With the purchase of H.J. Mulliner in 1959 Rolls-Royce didn't really start a sort of in-house concurrence. Only for the time needed to arrange a merger of both companies into one unit these were run separately.